This is great news for Kent, his family, friends and the Body of Christ!! Prayers have been heard and answered! -W.E. In honor of his release, you may be interested to watch and listen to this presentation by Dr. Hovind. On July 8th at 9:00 AM Pastor Kent Hovind walked out of Yazoo City Correctional Facility in Yazoo City, Mississippi, a free man!! After more than 8.5 years of incarceration, Pastor Kent finally returned home Wednesday evening. It was his first taste of freedom since before Obama became President. Can you imagine how much the world has changed since he was first locked up? Can you imagine the joy he must feel sleeping in his own bed and going to the refrigerator and having a snack whenever he feels like it? Can you imagine the joy of holding his grandchildren with whom he can now begin building a relationship? Free at last! Free at last! Thank God Almighty, he is free at last. There are many tips-of-the-cap that must go out to those who fought hard for his release. Rudy and Erin Davis dedicated the past 6 months of their lives to fighting for his liberty. Ernie Land, Kent’s trusted friend of over 25 years, proved his mettle in keeping the flame burning on the outside, serving as gatekeeper for those trying to fight for Pastor Kent. Racer X headed up the website FREE KENT HOVIND and was instrumental in keeping the information updated. Many others played a role in this sordid story with the happy ending. Thank God for Bill Olson and Herb Titus who prepared the motion to dismiss that ultimately served as the poison pill to the government’s trumped-up charges of “mail fraud” designed to keep Pastor Kent in jail for the rest of his life. Bill and Herb, along with the United States Justice Foundation, stopped the government in their tracks as they tried to railroad a man who had spent 8.5 years of his life in jail for “structuring”…something the IRS Commissioner himself admitted in February had been used illegally against law-abiding citizens all across this nation. Finally, Pastor Hovind is home after serving nearly 105 months in jail for something that we now know wasn’t even a crime. It would be worth your time to listen to this brief interview with “Dr. Dino” from the day of his release in which he warns other Christians to be prepared for the persecution that lies ahead. We would do well to heed his words. After the recent charges of “mail fraud” for mailing a letter from jail were dropped, Pastor Hovind was transferred to the prison in Yazoo City where he spent the last month of his incarceration in solitary confinement. Yes, you read that right…a small 8 foot by 10 foot cell where he was not able to have visitors, make phone calls, or even to exercise outside of the cell…alone 24 hours a day—the government’s last “take that” for daring to defy their tyranny. It was out of that hell-hole that Pastor Kent finally walked on Wednesday. As is his style, Pastor Kent is grateful to God for the opportunity to serve Him in prison, as are the nearly 900 men who came to know Jesus as a result of Pastor Kent’s daily Bible studies in the many prisons amongst which he was transferred. We should all be humbled by this faithful man of God and his never-say-die-commitment to serving Jesus no matter where he is. Thank God for the lone juror who would not relent in Pastor Hovind’s February trial on mail fraud. If not for him and his jury nullification, Kent would not be free today. Many of you reading this have been critical of Pastor Kent, calling him a tax cheat and tax evader (neither of which is true) and claiming that his behavior was “not that of a Christian man.” Pastor Kent is head and shoulders above those self-righteous “brothers” who rejoiced in his punishment. I pray the Lord grants you the grace you didn’t offer Pastor Hovind when you stand in His courtroom. So after having nearly a decade of his life stolen from him, Pastor Hovind returns home to the battle for Truth that is now raging across this nation. His mettle has been tested and he has come through the fire perfected by persecution and committed to winning the lost for the King he serves. After a mandatory 30 days of home confinement, Pastor Hovind will be free to travel and crush the lie of evolution which has been the heart and soul of his ministry for over 30 years. He is so anxious to get back into the game. • First of all, fall on your knees and thank God for delivering Kent out of Caesar’s dungeon. The thousands of you across America who have been praying for Pastor Kent have seen your prayers answered. • Send a donation to USJF.net. They worked quietly behind the scenes without much fanfare to give Kent the kind of legal representation that this man of God deserved. Most of the “Christian” law firms that are more well-known and well-funded wanted nothing to do with the case. We now know of an organization that is not afraid to take on the big boys and big issues coming down the pike. If not for the USJF, Pastor Kent would likely have gone to prison for the rest of his life. • Suggest that your local radio station interview Pastor Hovind. He has 30 days of confinement within his house and would like nothing more than to be able to tell his story to the nation. Contact me and I will put you in touch with Dr. Hovind. • Encourage your Pastor to schedule pastor Hovind for a creation seminar in your church. He is truly the world’s greatest teacher when it comes to creationism vs. evolution. Noting will build your faith more than an evening with Pastor Hovind! 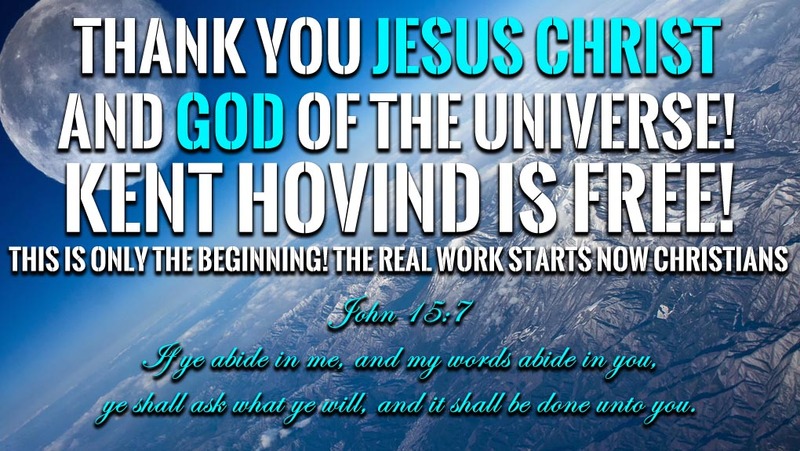 Kent Hovind is a free man and we thank God for him and for his life. Together, let’s help God ‘restore unto him the years that the locusts have eaten.’ They just didn’t steal from Pastor Kent; they robbed all of us of the Truth he was capable of imparting. There is much work to be done, and Pastor Kent is itching to get back into the game. God bless you all and thank you for all your prayers! KENT HOVIND IS FREE! First ever video after the release of this amazing brother in Christ!